This is part of my Photography HOWTO series and follows on from Getting Focus. I will be looking at the basics of exposure controls, and how to get a good exposure. Our eyes put us at a disadvantage as photographers. The image we believe we see is in fact a fake and we can easily be tricked into seeing things that don't actually exist. What we see is in fact a mental model based on what our eyes see, and we have two of them which makes things more difficult (see the blog on Lighting later). Our eyes automatically adjust for light, colour of the light, position of the light and much more. The catch is that a camera doesn't, though the modern ones try very hard. The first thing to understand is dynamic range or contrast (and ignore the cooked numbers that camera and scanner manufacturers publish for now). This is essentially the ratio between light and dark, and the important thing to understand is that it limits what we can see (or a camera can capture). Where there is too much dynamic range in an image, something has to give: the lighter areas will end up completely white, or the darker areas completely black. We (nor the camera) can't see the detail on something dark in the presence of a bright light (think classic movie interrogation scene with a light shining in the prisoner's eyes), nor something very bright in a largely dark scene. The bad news is that cameras are far worse than the human eye. Traditionally the rule of thumb of 5 stops or a ratio of 32:1 for brightest to darkest areas in a scene, and even though we have far more control over dynamic range with digital when using RAW, I think it is still a good rule to work by for every day photos. Exposure is about getting the important stuff we want to see in the scene within the usable dynamic range of the camera. The built in meter in modern cameras will normally do a good job in average daylight conditions, but in difficult scenes (eg. moon on a dark sky, or person standing in front of a bright window), they will often get it wrong, simply because the camera does not understand what is important in the scene. Newer cameras with face recognition certainly help when people are involved, but if you really want to get it right, then you need to understand what is going on and take control of the exposure yourself. That means letting go of the "easy" modes on the camera and using the advanced settings, even going to full manual sometimes. These are the three parameters that are available to choose to get the exposure right. ISO (film speed), is a measure of how sensitive a film (or sensor) is to light. With film, this can be varied by choosing a particular type of film with the right rating along with developing it to alter the sensitivity (push or pull processing). With digital, this is generally just a case of selecting a value from a menu, though there are techniques (especially using RAW) that we can do the equivalent of push or pull processing to alter the effective sensitivity. Normally this is set at a nominal value for the lighting conditions and then the other parameter varied to match. The general rule is, the lower the ISO, the less sensitive the film/sensor (ie. requires more light), the sharper the image and the less noise or grain in the image. The higher the ISO, the more sensitive (ie. requires less light), the fuzzier the image, and the more the noise or grain in the image. In general, we want the highest quality (lowest ISO) that is practical under the conditions, but sometimes for artistic purposes we can deliberately go for a noisy / grainy image. From the previous focusing blog, we should know all about apertures for controlling depth of field. A side effect is that the smaller the aperture (higher F number), the less light hits the film/sensor. We can choose to deliberately use this to control the exposure, or we can decide that the Depth of Field (DOF) is important so we choose to vary other exposure parameters (shutter speed and ISO) to maintain the aperture and hence the DOF. The final parameter is the shutter speed. This is how long we allow light to fall on the sensor. The shorter the time, the less light and the darker the photo. The longer the time, the more light, and the brighter the photo. The side effect is that the longer the shutter speed, the more that motion (both from what we are photographing, and from the movement of the camera) will cause blurring in the photo. This can be done deliberately (eg. blurring the background as while photographing a car passing at speed or to give flowing water into silky smooth appearance), or maybe to freeze motion (catch an athlete in stride or a bullet at the point of impact). The key here is to understand what the picture is about, and what needs to take priority. From there, set the main parameter to achieve the picture, then look at the next priority, and set that to give the right exposure (bring the scene into the dynamic range of the camera). Example 1: We want to photograph a person with the background completely blurred so they are isolated in a crowd. To do this we know we need a large aperture (small F number), so we set the aperture to F/4. Then we need the best possible image quality, so we set the ISO to 100, and lastly, to get the right exposure in the available light, the meter tells us that we have to set the shutter speed to 1/180 to match the other two parameters. Example 2: We want a photo of an athlete in mid stride (freeze the motion). To do this we need a fast shutter speed, say 1/500. Then, we also want to blur out the background to draw attention to the athlete, so we choose F/5.6 for the aperture. Now because the light isn't so good, the meter tells us that we can't have that combination and we are forced to increase the ISO to 800 to get enough speed, but that doesn't give us a good enough quality image, so we decide that by allowing more background blur by changing the aperture to F4, we can increase reduce the ISO to 400 and get acceptable image quality. Try this 1: How would you prioritise the parameters for getting an arty image with lots of film grain / noise for a landscape scene (ie. sharp from foreground to the horizon)? Try this 2: How would you prioritise the parameters to get a river with a silky smooth texture in the water? Hint: we need to allow the motion of the flowing water to blur. These modes give us a short cut to what we just did, assuming we have already set an ISO that is suitable for the conditions. A or Av (depending on your camera) allows us to set the aperture to get the depth of speed we want, and the camera will use the meter to set the shutter speed to get a good exposure. The gotcha is to look at the shutter speed and recognise if it is sane: Can we safely hand hold the camera at this speed? Is there scope to lower the ISO and get a better quality image? S, T or Tv (depending on your camera) allows us to set the shutter speed we want, and the camera will use the meter to set the aperture to get a good exposure. The gotcha once again is to check if the aperture is sane: Is the aperture at the limit of the lens (eg. cheaper lenses may only be able to go to F/4)? Is there scope to lower the ISO to get a better quality image while still getting enough depth of field? To get a sharp photo, we need to ensure that we avoid motion blur. To do that we need to avoid hand holding the camera for long shutter speeds where we would move the camera enough to blur the image during the time the shutter is open. There is a rule of thumb on 35mm cameras: to keep the photo sharp (assuming you are being careful to keep the camera still), use a shutter speed faster than 1/lens focal length. For example, for a 100mm lens, we should ensure the shutter speed is faster than 1/100th of a second, so 1/180 would be plenty, but 1/60 would probably give us a photo blurred by camera shake. The higher the shutter speed, the less the camera shake blur. I would recommend that if you want to ensure really sharp photos that you actually double this figure. For example, with a 50mm lens shoot 1/100th of a second or faster, or with a 200mm lens shoot 1/400 or faster. What about non 35mm cameras? 35mm format is becoming rare these days and with digital cameras typically it is only the top dSLRs in the range that have a full frame 35mm sensor. The answer is simple: use the 35mm equivalent figures. These are often in the specification for compact cameras (eg. a typical compact may have a 35mm equivalent lens of 38-120mm), or for dSLRs, use the lens multiplier from the specification and just multiply the lens you have fitted by that. This is typically 1.6x for most Canon and 1.5x for most Nikon. For example, a 50mm lens on a typical Canon would be 50x1.6 = 80mm equivalent. So we need at least 1/80th of a second or faster to hand hold it. Try this 3: For a 28mm lens on a 35mm camera, what shutter speed would you need to use? Try this 4: How about for a 100mm lens on a Canon dSLR (1.6x)? Optical image stabilisers have been around for several years, and are now even becoming common on consumer compact cameras. The idea is simple: make the lens a little wider to see more of the image, and have some nifty optics and electronics to shift the image (look through a different part of the lens) as the camera moves to follow the scene. This keeps the same thing in the same place on the film / sensor as the camera moves. There is one catch: The sharpest part of the lens is the middle bit. By using an image stabiliser, the camera is taking the photo through some part of the the lens which may not be the middle in order to compensate for movement. This means that there is a risk of inconsistent results and lost sharpness by using the stabiliser when it is not needed. My advice: Leave the stabiliser turned off, and only turn it on when you need it (low light). Another thing to understand with optical image stabilisers is that they normally can't compensate for camera roll, so be very gentle when pressing the shutter button so you don't twist the camera. Personally, I have sold my last image stabilised lens and now rely on good camera handling skills instead s.
This is an opportunity to use full manual mode (M on the dial) and take full control of exposure. Digital cameras often give the option for displaying a histogram for the image you have just taken (and sometimes the one you are about to take). This is about the best way to meter if you know how to use it, since unlike a camera meter, it provides metering information on the whole image and the ability to prioritise different things to take the photo you want, not just according to the parameters set in the metering algorithm. Along with a histogram, cameras can often be set to flash the highlights that are at the limit so you can see what parts of the image are whited out. 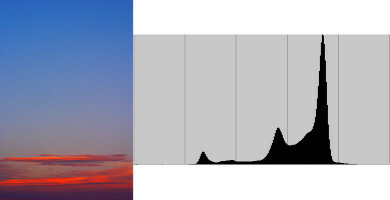 All a histogram is is a graph of the number of pixels at each brightness level. What this tells us is how the scene fits within the dynamic range of the camera, which is pretty much the whole aim of getting exposure right: getting the optimum fit of the scene in the dynamic range. Left to right we have the brightness, and upwards the number of pixels at that brightness. With digital, anything off the ends is permanently lost (with film, there was often stuff we could still do). Start off by looking at the scene - what is important in this scene? Where does it fit in the brightness scale? For example, we may be taking a photo of a night scene with some bright lights around. Being able to see the scene (ie. it is not completely black) is important, and we can allow the bright lights to be whited out to achieve this - that's the compromise we choose. To do this, we take some test shots first, and set exposure to allow highlights to go right off the right end of the histogram, in order to bring the main image up above complete back. The peak at the right edge is the lights which we have allowed to completely white out, in favour of moving the main scene (the big peak to the left) up from complete darkness. A camera meter might have tried to keep the lights in the range and as a result ended up with a mostly black photo, or more likely tried to bring most of the image into the middle which is not the intention (this is a night scene - it should be mostly dark), and completely blown out any lighter bits like the writing on the road. Another example, shooting a snow scene - most of the image will be white, but we want to keep texture in the snow so prevent it completely whiting out. We bring our exposure down so the histogram shows the main peak on the right (snow) is a little right (darker) than the right edge, but we allow the brightest parts of the clouds to white out (the peak on the right edge) so that we don't end up with dull grey snow (the snow peak in the histogram would be in the middle in this case). Under exposure - the way to spot this is that there is no (or few) pixels up the right end of the graph (close to the edge). This will often be the case with snow scenes (like above) if the camera meter is left to it's own devices. 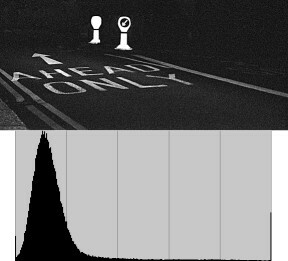 Meters will often try and bring most of the scene into the middle of the dynamic range of the camera, though modern camera meters are getting more intelligent and don't always do this. Gotcha: This is an example of deliberate under exposure. We may not want to always completely white out the highlights in a scene (eg. sunsets, fireworks etc.) where we want to keep the colour and texture of the brightest parts. For this we may want to deliberately make sure there are no (or few) pixels right up against the right hand edge. In this case the whole range of the photo has been pulled into the middle of the camera's dynamic range because that suits this photo. The bottom line is to understand the scene: What do we want to do with the different tones in the photo? Do we want the highlights blown out (eg. sun sparkling on water)? Do we want to keep the image from whiting out? Do we want do add mood to the image by making it deliberately dark? At this point, we should have enough information to operate the basic camera controls and take a technically good photo. The next step is to start making the photos we are taking more interesting, but more about that in the next article. 1: To get lots of grain / noise we need a high ISO, say 1600 or 3200. To get the image sharp from foreground to the horizon, we need a small aperture (large F number), say F/16. And then we let the meter tell us what shutter speed we need to get good exposure. 2: To get silky smooth water, we need a long exposure, for fast flowing water say 2 seconds (and a tripod for the camera). Since we want the whole river (and probably background too) to be in focus, we need a small aperture (large F number - see part 1), say F/11 which won't compromise sharpness to much (again, see part 1). Then to get the right exposure, we find we need to set the ISO lower to get the camera meter to give us 2 seconds at F/11, but the camera only goes down to ISO 100. To solve this we can compromise slightly and stop down more (smaller aperture, ie. larger F number) to F/16, and the meter tells us that this gives a good exposure. Another thing we could do in this situation is to use a ND (Neutral Density) filter on the camera to reduce the light level - this is effectively like the camera wearing colour neutral sunglasses. 3: For a 28mm lens we would need to shoot at 1/28th of a second (1/30 is closest standard speed), but if we want to be really sharp, around 1/56 (1/60 is the closest standard speed). 4: For a 100mm lens on a 1.6x lens multiplier camera, we get 160mm equivalent. That means we need to be shooting at 1/160th of a second or faster, but again, if we want to be really sharp then 1/320th or faster is better.